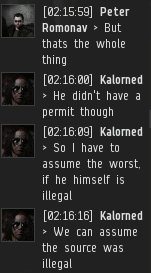 Agent Kalorned is well known in the highsec community as an advocate for miners. Legal miners, that is. There's no reason anyone with a rational mind would support illegal mining. 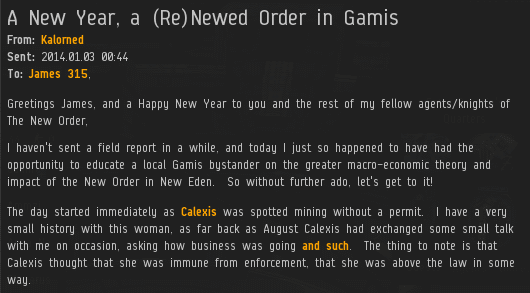 Illegal miner Calexis was setting a bad example, openly defiant of the Code. But contrary to what the rebels would have you believe, Kalorned gave her plenty of chances to reform. Kalorned > You must obtain a mining permit in the amount of 10m, good for one year, to continue mining. Failure to have a permit will result in my having to bump your ship away from the belt until such a time that you become compliant. Calexis > Not tonight, but thanks. Sometimes the mouthiest miners have the worst tanks. 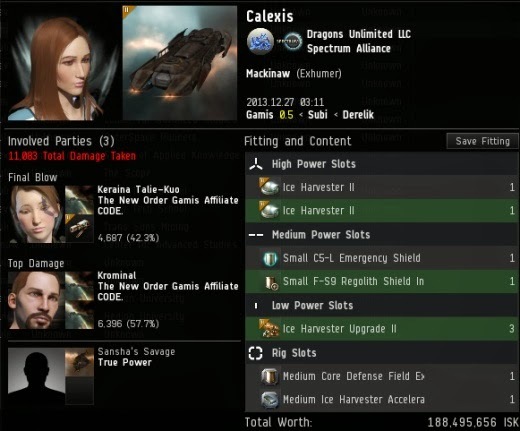 After being shamed in public, Calexis decided to "beef up" her tank and return to the belts a few days later. "Beef up" might be generous: She merely swapped out a shield extender for an armor rig. 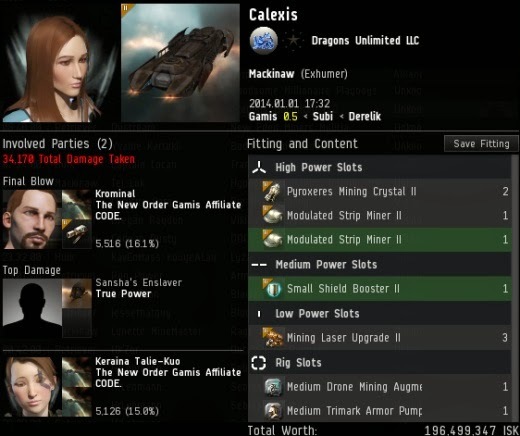 Calexis was put out of business, but new threats emerged in a nearby system. The rebels were on the run, and they left their "friend" to die. In the end, every rebel learns that their real friends are in the New Order. The police are not the enemy. The criminals are the enemy, even to other criminals. Over time, the New Order wins hearts and minds as well as battles. Responsible citizen Peter Romonav saw something terrible happening in Gamis. So you know what he did? He went to Agent Kalorned for help. Peter had learned the New Order is here to protect highsec. Kalorned called upon all the strength and power he possessed and defeated the AFK industrial ship in battle. 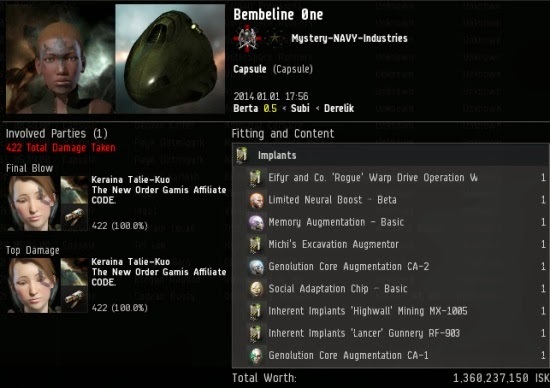 436 million isk worth of contraband, some of which is shown here, was destroyed and confiscated. It can no longer be used to pose a threat to highsec. Mixed reactions came from the Gamis locals. Kalorned instinctively realized that this was a teachable moment, so he began talking Samuel Tenko through the logic of the kill. With guided questioning, Kalorned brought Samuel to one inescapable conclusion: The industrial ship had to be ganked for the greater good. But Samuel still wasn't sure. Not yet, anyway. Like I said, over time we win hearts and minds. Peter Romonav, the informant, tried to help the locals see reason. Not everyone joined the New Order that day, but Kalorned held their complete attention. In the end, for his services as a good citizen to highsec, Peter Romonav was awarded a portion of the loot from the Iteron kill. More goodwill was earned, and the New Order strengthened its ties to the local Gamis community. The New Order's reputation as problem-solvers is established anew each day. So rare the best quote of the post doesn't come from James. Samuel Tenko > what have you ever given back to gamis? I little shiver went down my spine. Need to talk to the clone vat attendant to get my implants looked at. "but don't dress it up with new order..."
I keep running into this attitude. People who claim to support ganking, then turn right around and call NO a cult or something. Why is ganking without inherent purpose acceptable, but ganking in the name of something is objectionable? i think you are looking for the workd "hypocrite"
Just another die-hard carebear that claims to support this kind of "theoretical ganking", but always seems to find an excuse to object to any actual incarnation of it. I've actually seen them switch excuses live, on the internet. Miss y'all, keep up the good work Kalorned! They support your "theory" at first...until they realize that the code that you base your actions on doesn't actually follow your "theory". You just have it there to make you look better when in fact you are the same as any gate camper offering a fee to not fire on the transport ship. The only difference is at least the gate camper doesn't try to insult our intelligence by pretending to do it to "help" Eve. 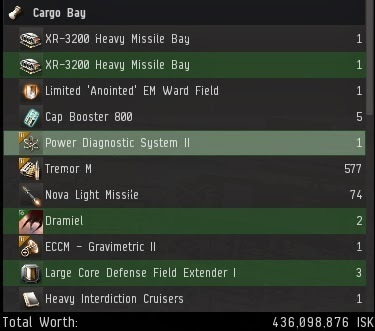 The only person who benefits in each case is the ganker/camper. There seems to be a small minority of the killmails that seem to actually be afk/bots. The rest are just called rebels and ganked anyway. 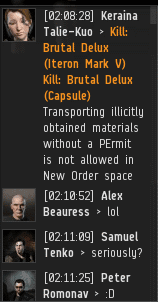 We know that there are many killmails that don't get posted here. You win people over only because it seems that most people get a "if you can't defeat them, join them" attitude since there is no real organized opposition to it. Then actually try to justify it "as any bullies buddies would" when they see how fun/profitable it can be. "Courtney Brown >I mean don't get me wrong I LOVE the fact someone is taking CONTROL of this space." This is an opinion we see more and more often. The residents of highsec are crying out for some leadership, some direction. 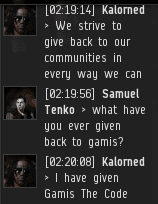 I, for one am glad that James and Kalorned care enough about highsec to do something about it. Just fantastic Kal, couldnt be more proud of the way youve put your personal stamp on Gamis and its surrounding systems. I believe the Grand Llama would be very proud as well! Well done by Peter also. New Order Cash for Tips - Emergent gameplay at its finest. why do we need to go to 0.0??? 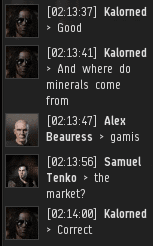 so many of the miners are "nullsec residents" that cant seem to shake the addiction of mining highsec ores for pennies. we also cant forget they also have "powerful friends"
at least thats what they claim. but thanks anonymous, for being anonymous. we couldnt do this without you. oh, yes we could, my mistake. Yes, way to go Kalorned. You showed once again that New Order ganking can eliminate three or four ships out of thousands. At this rate James may be able to crow about being the savior of half of one percent of highsec before the diabetes and the bad heart end it all for him. Sad way to live your life but those of us who are not stuck living in our parent's basement just can't understand the pain and bitterness. Keep going, these is good tears. you would know about the "bad heart" wouldnt you anonymous? The Code is held like a star burning bright in the soul of the New Order Agents and its Knights! Our hearts do not fear the extra salty tears and stale rhetoric of another nameless complainer that has noting to show for himself. Please stop by any system that you find a New Order member in, and we will make some toast, for all that -jelly- youve got.